Prof. Oh-Hoon Kwon received his Ph. D. degree from Seoul National University, Korea in 2004 on photophysics and photochemistry in elementary reactions. Following postdoctoral training under the supervision of Prof. Ahmed Zewail, Nobel Laureate of Chemistry in 1999, at California Institute of Technology he returned to Korea in 2013, as an assistant professor in the Department of Chemistry at Ulsan National Institute of Science and Technology. Prof. Kwon developed the second-generation ultrafast electron microscope as a member of a collaborative team in Prof. Zewail’s group. 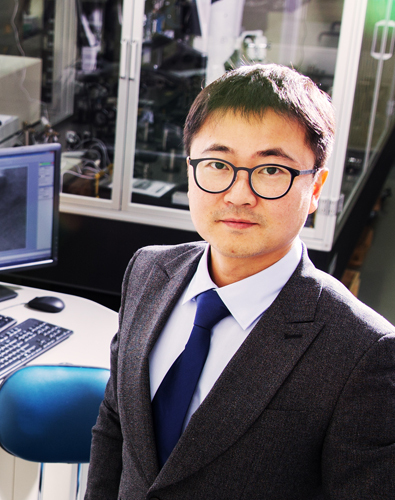 Now one of his diverse interests in Ulsan is the development of an upgraded versatile ultrafast electron microscope and the expansion of its scope for the studies of reversible and irreversible phenomena of hard and soft matter in a variety of fields. Our special interest is focused on nonequilibrium photoinduced phase transformations in nanomaterials, ultrafast electron-phonon interactions in correlated materials, photoinduced structural dynamics at a single-particle level, ultrafast chemical dynamics, and ultrafast hydration dynamics in proteineous systems, using both femtosecond-resolved electron microscopy (imaging, diffraction, and spectroscopy) and femtosecond-resolved optical spectroscopy. 권오훈 교수의 연구실은 현재 펨토초 시간분해 전자현미경과 전자전이 분광기를 이용하여 다양한 물리적 현상 및 화학 반응, 생물계의 동역학을 연구합니다. 현재 연구 주제로는 나노재료의 비평형 광여기 상변화 현상, 초고속 전자-포논 상호작용, 단입자 수준의 광여기 구조동역학, 단백질의 초고속 수화현상 등이 있습니다. Renske van der Veen, Oh-Hoon Kwon, Antoine M. Tissot, Andreas Hauser, and Ahmed H. Zewail, Nature Chem. 2013, 5, 395-402. Oh-Hoon Kwon, Volkan Ortalan, and Ahmed H. Zewail, Proc. Natl. Acad. Sci. USA 2011, 108, 6026-6031. Oh-Hoon Kwon,* Tae Hyeon Yu,* Christina M. Othon, James A. Van Deventer, David A. Tirrell, and Ahmed H. Zewail, Proc. Natl. Acad. Sci. USA 2010, 107, 17101-17106. Oh-Hoon Kwon and Ahmed H. Zewail, Science 2010, 328, 1668-1673. Fabrizio Carbone, Oh-Hoon Kwon, and Ahmed H. Zewail, Science 2009, 325, 181-184.